DOVER, Del. 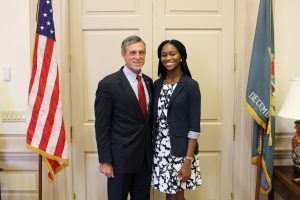 – Governor John Carney released the following statement after speaking with young women of the Delaware American Legion Girls State Program. Governor Carney spoke with the American Legion Boys State Program on Tuesday, June 13. 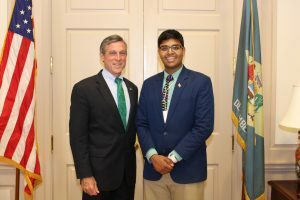 Governor Carney addressed both programs and met individually with the Boys State Governor, Shreyas Parab of Archmere Academy, and the Girls State Governor, Natalie Nwanekwu of Newark Charter High School. Governor Carney and Girls State Governor Natalie Nwanekwu of Newark Charter High School. Governor Carney with Boys State Governor Shreyas Parab of Archmere Academy.